A teardrop garden candle lantern is the ideal accessory for lighting up your outdoor patio, porch, picnic area, gazebo or camp site. Whether you are planning a trip to see the stars or just want to enjoy a starry night in your own backyard, the teardrop lantern is both intimate and practical. Most teardrop garden candle lanterns are inexpensive, designed for practical use despite their elegant appearance. But, it doesn't hurt to do your homework before you make a purchase. The last thing you want to be is stranded on an overnight trip with an unreliable lantern. May hold more than one candle - Candles equal light. The more you have in a lantern, the more light it will produce. You may not always want strong illumination, but it is good to have the option available. Have glass sliding sides - You want a lantern with glass sliding sides. Changing candles, lighting them or otherwise having to fuss with the lantern should be simple and straightforward. The sliding panel means you can get your candles in and out easily without damaging the lantern or the candles. Are designed for outdoor use - While this may seem an obvious item to check off the list, many lanterns are decorative only and not designed for long-term outdoor usage. If you don't want to take the lanterns down every time you are done with them, then you want a practical design that won't scratch, ding or shatter. If you are looking for a teardrop garden candle lantern purely for decorative purposes, then you'll find a wider selection of lanterns that are dependable and low maintenance. Most garden lanterns are designed for your decks, patios and gardens. They offer low and subtle light as well as colored panes for atmosphere. The great thing about these types of lanterns is you are not limited by theme. For Fourth of July picnics, you can mix red, white and blue lanterns. If placed strategically, they can give the appearance of high quality string lights. Lanterns have an exotic feel to them that offer illumination without shattering the intimacy of a beautiful evening under the stars. 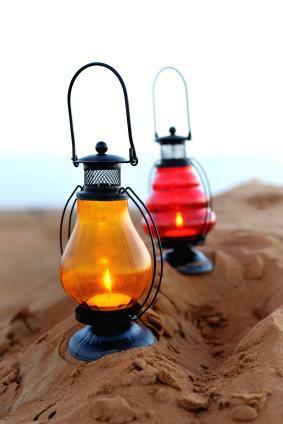 Whether you are planning a romantic dinner for two or a family gathering with the neighbors, the lanterns are a practical alternative to glaring outdoor lights that can attract mosquitoes and moths. In fact, if you use citronella infused candles in the lanterns, they will do double duty as both bug repellent and mood setter. In addition to setting the mood, lanterns are a great item to have on hand for power outages. The novelty lighting will become practical lighting until the power comes back on. You can shop for teardrop lanterns online or in local stores. Many online outlets, such as AspenCountry.com, offer Moroccan style designs. The antique coloring and lighting gives a warm, intimate glow to any setting. Take the time to shop for the tear drop lantern that meets your needs and discover the decorative lantern with a very practical purpose.